Once upon a time, Nestlé Crunch decided to make a one-of-a-kind candy bar. Inspired by the most popular Girl Scout Cookie™ flavors and CRUNCH’s own iconic candy bar, worlds collided and the two came together. They dubbed it the NESTLÉ CRUNCH Girl Scout™ Candy Bar. Oh, it sounds just heavenly, doesn’t it? My favorite flavors are all included: Thin Mint, Peanut Butter Crème, and Caramel & Coconut. I couldn’t resist immediately eating the Caramel & Coconut bar, since I can usually eat five cookies right out of the package. The taste was exactly like the cookie, but with that awesome candy bar crunch. My kids were begging to eat them too and had fun picking out which one they wanted, according to their favorite Girl Scout Cookies. Thankfully, they all have varying tastes, so they each picked a different flavor! 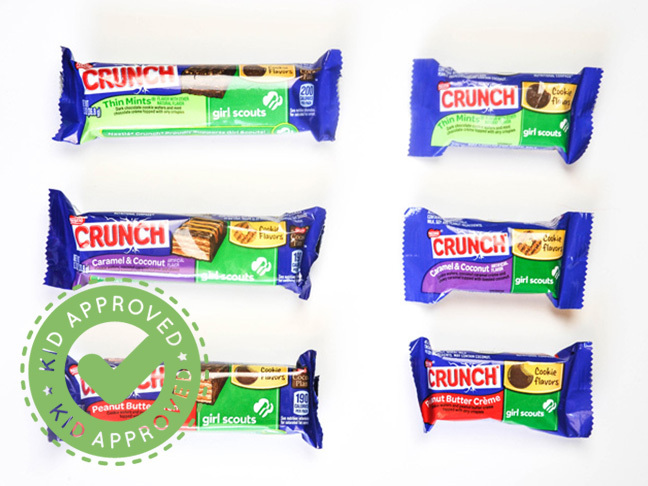 All three kids gave the Nestlé Crunch Girl Scout™ Candy Bars two thumbs up. Way up! They even had the tasty idea of crumbling them up over a bowl of ice cream. Yay for summer! Of course when I think of Girl Scout Cookies, my mouth begins to water immediately, thinking of that perfect taste and texture that we have all come to expect and enjoy from those cute girls in the green uniforms. For me, it’s not just about the cookies—although I’d be lying if I said it wasn’t a huge factor—but I love that the girls are learning about interacting with the public and becoming entrepreneurs. It teaches them about hard work and what you can accomplish when you set your mind to it. There is nothing more valuable than hands-on experience when you are discovering how to become a productive member of society. Nestlé must admire the same virtues because they have committed to assisting young girls in getting to camp this summer by providing resources that will make it possible. When I was a kid, summer camp was the highlight of my summer. I couldn’t wait to bunk up with some of my best friends and be adventurous in the woods. Some of the experiences I had at camp still live in my heart today. What wonderful memories to have from our childhood! 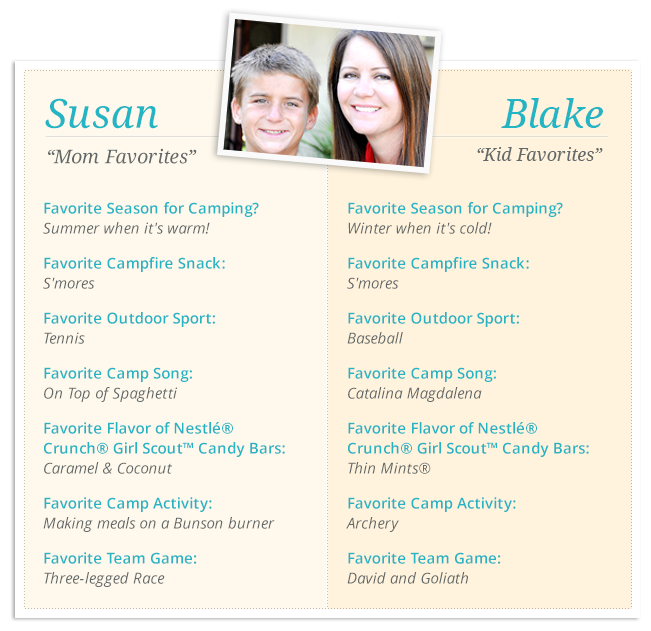 Now that I’m a mom and ship my kids off to camp every summer, I know they will have those same experiences. My boys always come home with spooky stories and daring tales of their time in the woods. 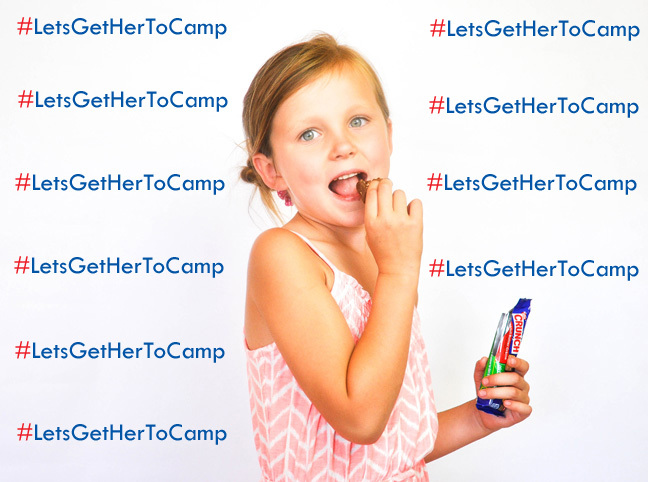 Nestlé doesn’t want any of the adventures waiting to be discovered to go untold, so they have developed a fun and interactive program that will help girls get to camp this summer. They’ve started some amazing campfire stories and want to see who can come up with the best ending. Click here for all the details! So, let’s all celebrate this glorious union of Nestlé Crunch and Girl Scouts with either a full size candy bar, or a snack size, which is the perfect bite for a quick Girl Scout-y chocolate fix. The honeymoon ends at the end of August, so make sure you celebrate the nuptials soon!